Join me this fall for an intimate workshop at my very own photography studio and garden in the historic and magical city of New Orleans. This experience will bring together 5 likeminded students together to learn the ropes of food styling and photography, as well as content creating strategies, Instagram tips and tricks, editing skills, and, of course, creating and eating beautiful vegan cuisine. 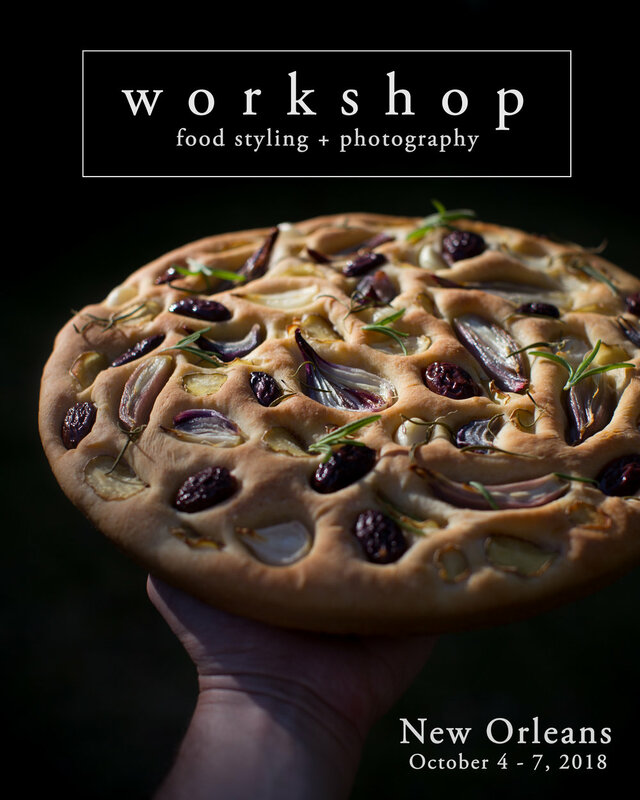 This 4 day experience will be an extraordinary opportunity for any creative to grow and establish a strong foundation in food styling and photography. Lectures include topics such as composition, light, shooting styles, camera settings, Lightroom editing, and more. My studio kitchen is equipped with multiple food photography backgrounds, vintage props, unique kitchen appliances, gorgeous ceramics, and plenty of natural light, as well as some artificial light, to utilize and shoot with. My herb garden boasts dozens of fresh herbs and edible flowers to use for styling as we go. All of this in combination with my collection of over 100 gorgeous cookbooks to peruse, my space is undoubtedly an ideal learning environment. This intimate worksop is designed to provide each student with the unique opportunity to see how I work behind the scenes in regards to cooking, styling, shooting, editing, working and posting content to my blog and Instagram. In comparison to large group workshops, this intimate style workshop is the ideal learning environment as there is more undivided attention and intensive hands on teaching. There is also a much more powerful connection and camaraderie with a smaller number of students. Each day will begin at 10:30 am. This will give each student the opportunity to have breakfast before they come to the workshop. The lectures will start promptly at this time. Lunch will be included and delivered by a local restaurant each day. The afternoons will consist of hands on food styling, editing, and critique, with a tea break. Each day will end at 6:30, which will give each student the opportunity to explore restaurants in New Orleans on their own, if they desire. This day will be designated for traveling and getting comfortable in the city of New Orleans. For dinner, the students and I will meet at a local vegan friendly restaurant to have an orientation, meet one another, and have fun! This will be an opportunity for everyone to get to know one another, discuss creative expression, branding, and overall goals. Welcome dinner, lunch, tea, water, snacks + whatever we make and style, coffee, lectures and classes, consultation and critique. Airfare, lodging, transportation to and from airport, transportation to and from studio, and all other meals that are not included for each day. For students living outside of the New Orleans area, the city has a fantastic airport with many connections and direct flights. For transportation to and from the hotel, studio, and restaurant, Uber and Lyft are commonly and highly used by visitors and locals alike. As for lodging, there are hundreds of hotels, bed and breakfasts, etc. available. My exact address will be provided once your spot is reserved so you can plan accordingly. Upon submitting the questionnaire below, a final approval for the workshop will be made and a deposit of 50% ($975) will be invoiced to reserve the spot. The remainder of the payment will be invoiced the day before the workshop. Due to the nature of this workshop, there can be no cancellations or refunds. Finding another guest to fill the spot is highly recommended. "Timothy's ability to connect with his students is like no other. He is a truly genuine person, and whoever has the opportunity to learn from him one-on-one will have a truly life-changing experience. He is a fountain of knowledge and creativity, and has a ton of experience, technique, and talent that he is willing to share. I have grown tremendously as a photographer and food stylist, and have gained the skills and confidence I need to move forward in my career thanks to Timothy. "Words cannot express how much I loved witnessing Timothy's artistic expression in person. There were moments I had to pinch myself for watching him cook and play with each ingredient like it was a painting. At times I had to wipe a tear or two for how touched I was to feel artistically connected. His creativity resonates with me so much. The way he plays with light, the way he celebrates each ingredient. He reawakened my connection to photography. Imagine seeing beauty that is too hard to handle on your own and you get to capture it in photos and share it with the world. The workshop was hands on, practical and informative and I am so grateful to have made some beautiful friendships along the way. If you are reading this far then definitely sign up. Watching Timothy in action in his homeland will, I'm sure, be a memorable experience well worth every penny. And no I am not paid for this testimonial I just loved the course so much that I could do this all over again!" "Wowie, my mind is absolutely blown away from everything I learned in this course. I legitimately did not know how to use a DSLR camera and left feeling confident in my camera abilities and super excited to start playing in my own kitchen. Timothy is a very hands on teacher ~ a culinary aesthetic genius and absolute pleasure to learn from! It's such a treat to have access to him and be able to watch him in action. I *highly* recommend this course, the experience with Timothy changed my life and it will change yours too!" "Timothy's love of food is infectious. Not only did we enjoy photographing the food, but it also was a blast cooking it and nibbling every now and then. I was hugely impressed by his patient and nurturing teaching style. He gave our group his undivided attention and pushed each of us to stretch our photography skills. Through his fun and playful storytelling, honest critiques and discerning eye, we learned the art of capturing the authentic beauty and character of food, which can only come from working with a true artist. Timothy is an artist through and through, and so much more. Overall, it was a week where Timothy gave all of his time, energy and dedication teaching us how to combine our love of cooking and food with the skill and artistry of photography. I left the weekend feeling that I gained a mentor as well as a lifelong friend." "Timothy is kind, hilarious, and fun—all of the things that make him an excellent host and someone you just want to hang out with. But, he is also exceptionally talented, has decades of experience at his disposal, and very honest—making him an extraordinary teacher. Most importantly, Timothy is an artist—he takes his craft seriously and applies the same attention to detail to his students. He takes the time to review your work before you even set foot on his doorstep, so that he can tailor the workshop to YOU to bring out the best in YOU. Just take a look at my IG gallery—it’s obvious to even an untrained eye precisely when I started applying what I learned from Timothy’s workshop. Not only that—my reach, engagement, and overall growth has increased exponentially since applying what Timothy shared with me. Plus, I ate like a freaking KING during his workshop!! In sum, I consider myself lucky to have had the chance to work with Timothy, to learn from him, and to call him my friend." If you are interested in joining me for this intimate workshop, I would love to hear from you! Please fill out the form below and I will be in touch with you as soon as possible. Once you've been accepted, I will invoice you the deposit. Once paid, your spot will be reserved. If you have a website with some of your work, please let me know here. If you have an Instagram with some of your work, please let me know here.